We believe that spiritual inspiration video clips are one powerful means of bringing a rich and varied devotional experience to worshippers of Our Mother God. While this site contains much informational and thealogical material, its true aim is to promote devotion to Our Mother God. We hope that the devotional writings and pictures will inspire you, but it is also our aim to use the full power of "media technics" to help bring a devotional and inspirational experience to Her children. As children of a patriarchal age we do not have Churches or Temples to our dear Mother, but spiritual inspiration video clips are one means of experiencing the sights and sounds of devotion. Virtual shrines are another way of enriching our devotional experience, and the creation of home shrines is another important step (you can read about these and visit a Virtual Shrine from our Shrine page). Here are links to our currently available videos. We hope to be adding to these regularly. If you have any feminine spiritual inspiration video clips to offer or suggest please contact us. We really appreciate suggestions from our dear readers. 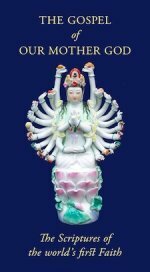 This is an absolutely beautiful dance depicting the compassionate Saviouress, Kuan Yin in her traditional Thousand Hand form, expressing both the ceaseless creative activity of Dea and Her ever-present care for every one of Her children. Each of the twenty-one dancers in this stunning performance is a deaf mute. It is presented here for the first time with a full déanic written commentary, explaining the thealogical and metaphysical meaning of many of the phases and movements of this breathtakingly beautiful spiritual performance. The title means "Lady Mary's Heart". This is a lovely Japanese hymn to Our Lady's Heart which contains some surprising and beautiful symbolism. While traditional, it was famously featured in an anime series called Maria-sama ga Miteru (Lady Mary Watches over Us): a lovely story of pure but passionate relationships between schoolgirls. While the fundamental Divine Heart symbolism is explained in our page on The Immaculate Heart of Mary, the page showing this video clip also includes a devotional and metaphysical commentary on the very special symbolism contained in this lovely hymn. 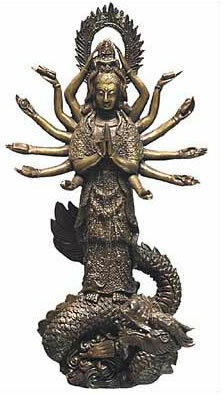 The Great Compassion Mantra was given to the world by Kuan Yin. It is a beautiful Chinese Mantra of great efficacy, believed to cure many ills and grant many blessings, both spiritual and material. This video clip presents the mantra chanted by a Nepalese Buddhist nun. On the page we discuss the traditional benefits of the Mantra and present a ritual for its use and an English transliteration. The page also contains another feminine rendition of the Mantra of Great Compassion in mp3 format, suitable for using with an iPod or other music player for daily devotion. The lotus flower is a symbol of the cosmos, and the dance in this video clip links it perfectly and appropriately to the great trinity of our Mother God. The three maidens, dancing in a seated position to gentle haunting music, represent Sai Lalita, Sai Mahalakshmi, and Sai Saraswati. On the page is also a brief analysis of the movements of the dance. We hope you will enjoy these feminine spiritual inspiration video clips and that they will enrich your devotional life. Please tell us if you have idea for others, or if you have a special experience watching them – or just write and tell us how you feel about them. We always love to hear from our dear readers! May Our Lady bless you all.